Discussion in 'Airheads' started by fxray, Feb 26, 2015. This was the view through the windshield when I first started thinking about getting a BMW. 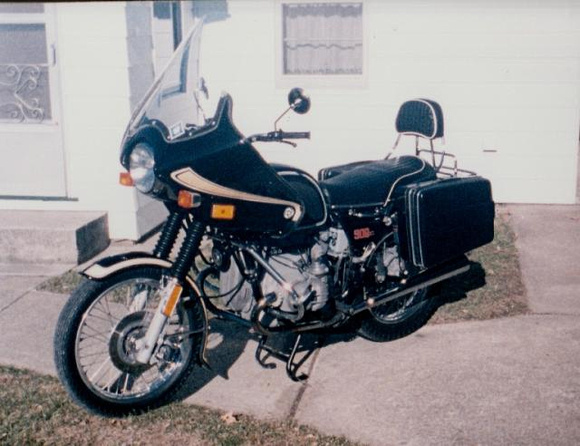 Here's a tale of how someone (that's me) who really never liked, cared about, or wanted a BMW Motorcycle wound up owning one. 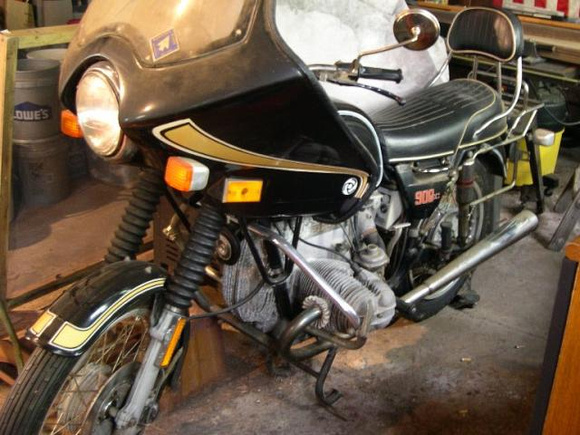 It's mostly just another first year 1974 R90/6 story, but I'll briefly introduce my other barn twins along the way. I know this part of Advrider is for airheads, but a lot of you guys like other bikes too. Up until about 3 years ago, I never had even the slightest urge to ever own a BMW of any kind. For over 20 years I have had several friends with a nice variety of newer BMW's. We all ride together, so I have kept sort of up to date with what BMW Motorrad was doing. They all loved their bikes, and I could respect that, but the style just didn't do anything for me. There was a lot of Harley vs BMW bashing all the time, but all in good fun. Most of them were long-time Harley riders who had gone over to the dark side. Because of them, I'm now even a member of the MOA, which is a stretch, because I don't own a runnable BMW (yet). One of those reformed Harley riders gifted me with a membership. My BMW attitude started to change in 2012, when I reconnected with an old high school buddy that I hadn't seen in quite a while. I found out that he had an airhead stashed away that had been parked since 1998. The reason he parked it was that he and his wife had been out cruising a back road and picked up a nail in the rear tire. They had a flat which led to an exciting ride, but he got it stopped with no major damage. He got it hauled home and there it sat. At the time, he was working long hours and they were into camping and fishing in their free time. Somehow he just never fixed that tire as 14 years slipped past. I first set eyes on the bike when circumstances caused him to move it into a building he owns. He doesn't like for me to call the place an old barn, so I won't. It's his workshop. (Hint: Picture an old barn in your mind and that will get you pretty close.) I started dropping in there from time to time to listen to music and BS and to look at that old BMW. Some were known to tip the odd can of beer or bottle of Jameson to keep the music, jokes, and stories going. It was a good place to hang out, and I used to sit on a stool to stare at this old beast. My main interest was that it was a complete machine that was just sitting there gathering dust. Back then I thought all BMW's were kind of ugly, but I began to think that this thing might be old enough to have some character. I guess I started badgering him to do something with it, even though it was really none of my business. He had (and still has) a nice Harley Dyna Glide to ride, and the BMW was just becoming sort of a novelty -- floor art, if you will. 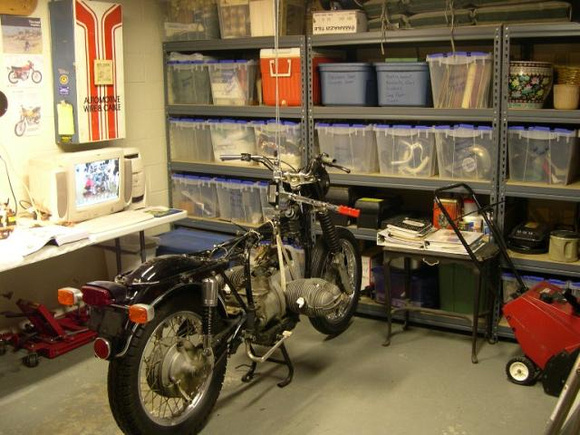 At the time, I was in the middle of a Triumph barn bike project. This was a complete bike, but it had been sitting for 39 years when I got it. Here's a picture of it when I first acquired it. Also, there's a build thread on Britbike.com if you are interested. I got the Triumph finished up in September, 2013, and the BMW was still sitting in the same spot. My BMW buddy came over to watch the first startup on the TR6, and it actually did fire up just fine. Over the next month, I ran up 1,000 miles on the Triumph to get it broken in and then put it up for the winter. By that time, we were talking about me buying the BMW, but we couldn't reach an agreement. slacker1965, zzzak, Pezz_gs and 3 others like this. LOVE that triumph! I had some non unit and unit bikes way back when. If you do not finish this story I will need to track you down. 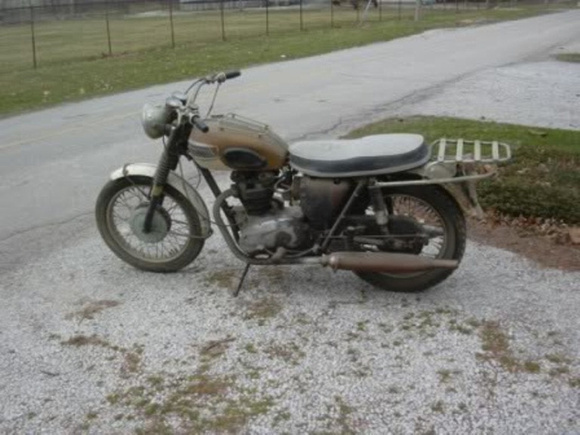 Love the Triumph, I need to have another one soon. I had a Single 500 and a 750 Bonneville that was a real mistake, but I still love them. 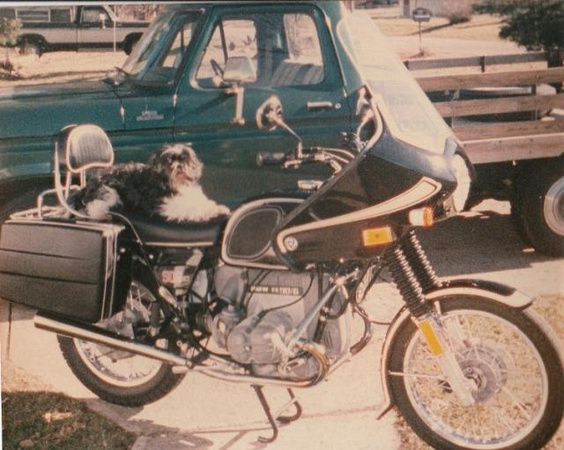 Many years ago, my very first bike ever was a '66 250 Yamaha YDS3C -- the mighty Big Bear Scrambler with the high pipes. I bought it back then from the guy who now has this airhead I've been talking about, so we go back a long ways. It seemed only right to have another 2-stroker after all these years and for him to go along to help me load it up and bring it home. We had a good day reminiscing. 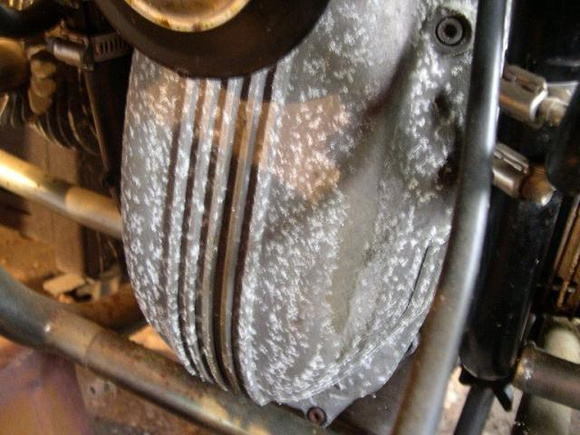 Meanwhile, the white rust a.k.a. aluminum oxide was starting to blossom and spread out back at the party barn, er . . . shop. Then I spent the winter of 2013 working on my little CL350 Honda. That was another former barn bike that had been sitting for 33 years when I got it. 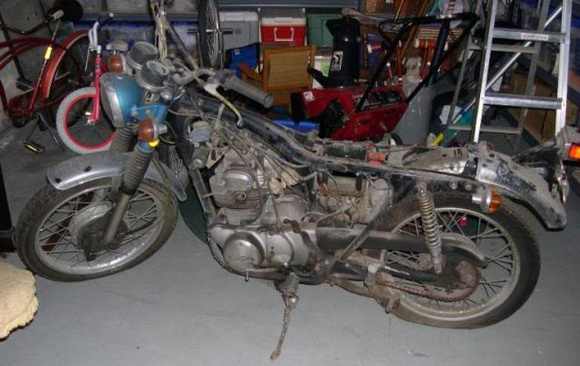 Partly disassembled, its engine, clutch, and rear wheel were seized, and it was almost ready to go to the scrappers. By this time I had bought a book or two about BMW and started reading the history and looking at the pictures. Then I started reading the forums. I started to think maybe BMW wasn't so bad after all and maybe I could discover what the mystique was all about. I was kind of amazed to find out how many people flat out love these old German bikes in spite of their known faults. It was just the beginning of my education. 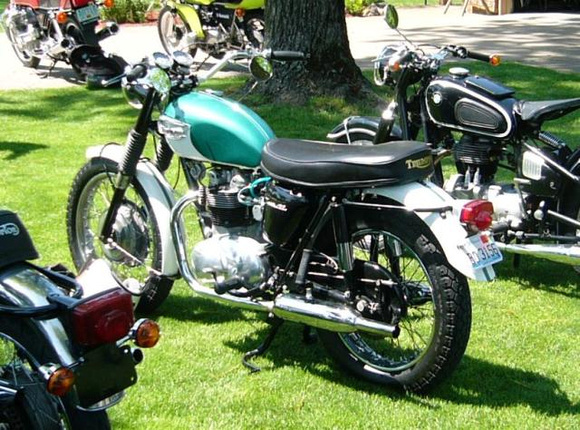 Achtung and kenbob like this.
. . . Love the Triumph, I need to have another one soon. 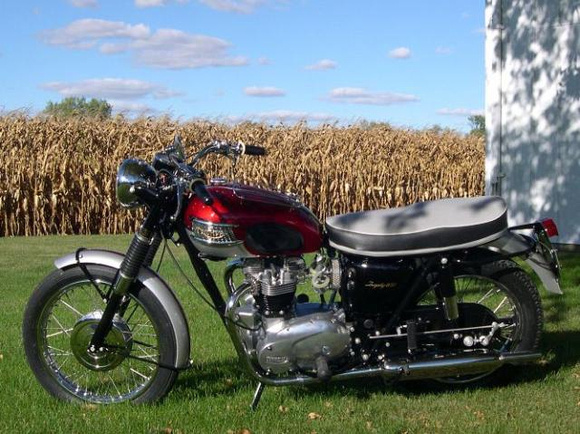 I had a Single 500 and a 750 Bonneville that was a real mistake, but I still love them. Thanks for the comment. Here's another pic you might like. Not all my friends ride BMW. This is a real nice running T100 that belongs to a guy I know. I think it's a '67. In this picture, he had it at a bike show and it was parked between a Norton and an old BMW (about which I know nothing). This is currently a barn twin, but only for the winter. Buying the old airhead wasn't that easy. The bike still wasn't absolutely up for sale. My buddy also thought it had character and he enjoyed as a decoration. We kept on badgering each other about it. One time when he wasn't looking, I really pissed him off by taking a bucket of water and a rag and cleaning the fuel tank and front fender to see what was under the dust and dirt. He said it took him years to get it the way it was, and he was not happy to say the least. My bad! Still, the paint looked pretty good under the dust. Another time when he was feeling no pain, I yelled at him to come take a look at his bike. I told him I was just sitting on it and something really weird had happened . . . letters started to fade up through the dirt on the rearview mirrors. I told him the devil must be sending him a message. One mirror said, "Sell Me"
The other one said, "To Ray"! He got a chuckle out of that, but he still wanted to keep the old bike. 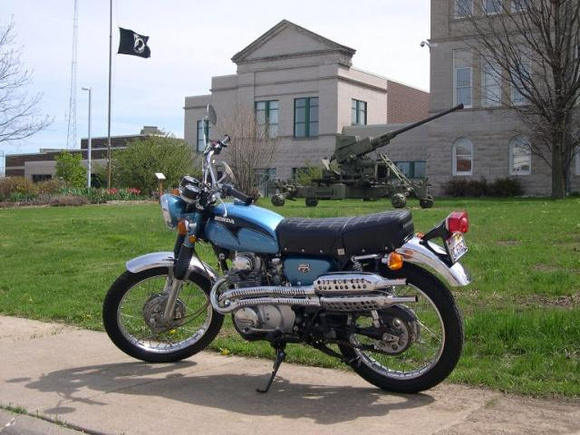 When I kept showing up on my CL350 to visit the BMW, he eventually decided he liked the little Honda and we worked out a trade with some cash coming my way, but then I couldn't pull the trigger. 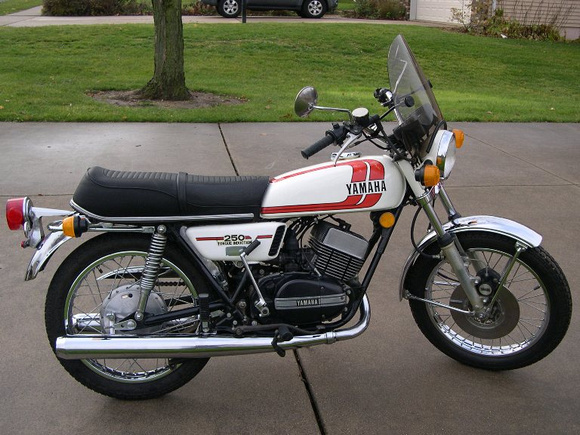 I love this CL350. We finally agreed on some cash and two half-pint bottles of Jameson (later he pimped me for two more). But he wanted a second bike and wouldn't let go of the BMW till he got one. I knew a guy with a really nice, low mile Sportster that didn't have time to ride it, so I put the two of them together, and the rest was history. For better or worse, I wound up as the owner of a 1974 R90/6. Pezz_gs and kenbob like this. Great story and even greater bike! I've got a weak spot for the R90 as that is my main ride. I think you'll really enjoy it and we'll enjoy watching you get it back on the road. Now, where are the photos of YOUR R90/6? Lessee em! So now we get to see what you'll do with the Beemer. I've seen your bike on Britbike and will enjoy your story here as well. I have a '74 /6 too. Currently modifying it to be a little different. When I brought the bike home, I didn't take pictures of it as a complete unit before I started pulling it apart -- dumb, I know. I wasn't sure I was going to start a build thread on it. But I have some more catching up on here to get to where I'm at now with it. I do have a lot of in-process pictures taken along the way. Hi Euromad, I saw your post over on Britbike.com a while back. I need to go on there and add a link to this thread since I finally got it started. I got a chuckle out of what you said over there. It sounded like an honest opinion. Feel free to jump in if you see me doing something wrong (highly likely). So, what I got was a dirty old bike that was running when parked, and was missing no parts. 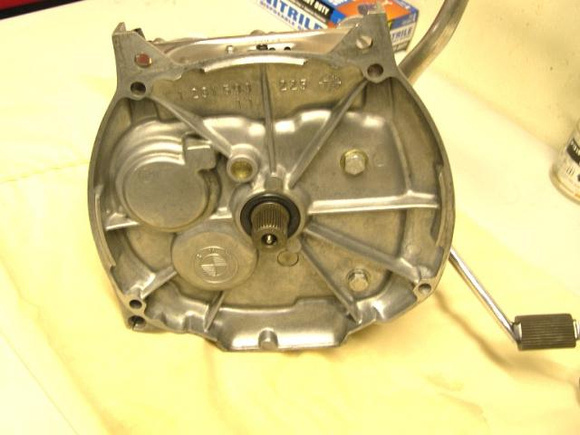 The engine was free, and the crankcase was still up to level with the old oil. It had been sitting for 16 years with a couple gallons of gas in the tank and the float bowls were also full, but the gas was still liquid. I've seen a lot worse in that department. I didn't have to buy a tube for the back tire. 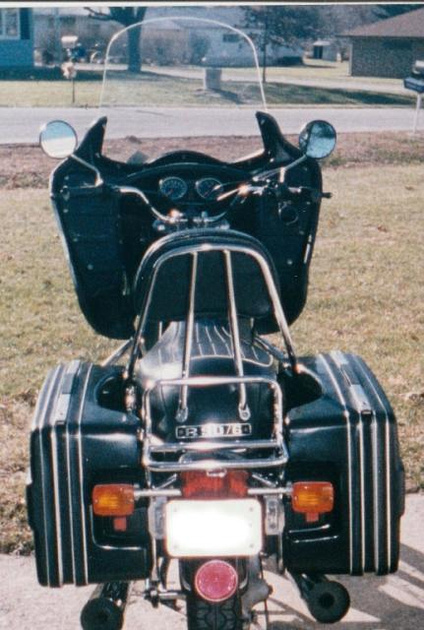 The front and rear tires on the R90 are the exact same size as on my Triumph. The TR6 was still wearing its original factory tires and tubes when I got it, so I had a nice Dunlop tube that came over from England in 1964. It still held air, so it seemed like the right way to get the BMW into a rolling state. 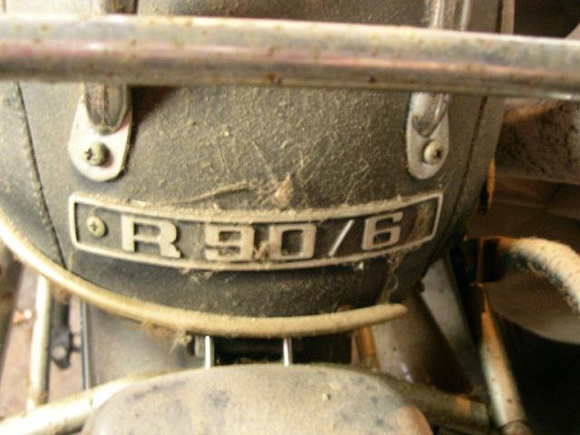 I'm aware that a lot of people would have cleaned up the R90, changed the tires, fluids, battery, etc. and had it running in a few days. That would make sense because I could have run a compression check and could have listened for weird sounds. Still, I opted not to go that route. I knew it would need all the things already mentioned, but it was also going to need seals and rubber parts replaced. The ATE master cylinder under the fuel tank had pissed its fluid all over the electrical stuff, as they all do eventually. The forks collapsed and stayed there as soon as they felt some weight. The alloy needed a good cleanup. The rear shocks, well . . . you get the idea. Plus I had bikes to ride anyway. I got it to where it would roll up onto a friend's trailer and brought it home to begin the BMW bonding experience. I had been wanting to try some Metal Rescue, and this looked like good guinea pig for that experiment. Parts need to be immersed in Metal Rescue for it to work, so I cut a piece of PVC drain pipe and glued a cap on one end. Then I put the muffler in there and filled it up. I stuck a cap on the other end with no glue, to keep the liquid from evaporating, and let it sit for a couple days. When I pulled the muffler back out, it had crap all over it, but it rinsed off with a garden hose. All the rust was gone, but the pits of course remained. 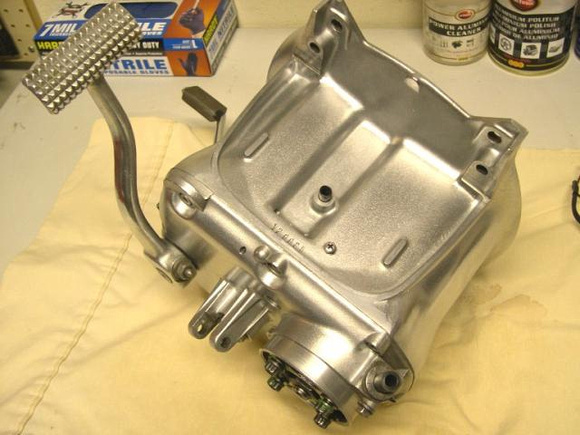 I polished it up a little more and painted the end cap with some POR-15 primer and then some high temp engine paint. The POR-15 by itself fades to gray in UV light. 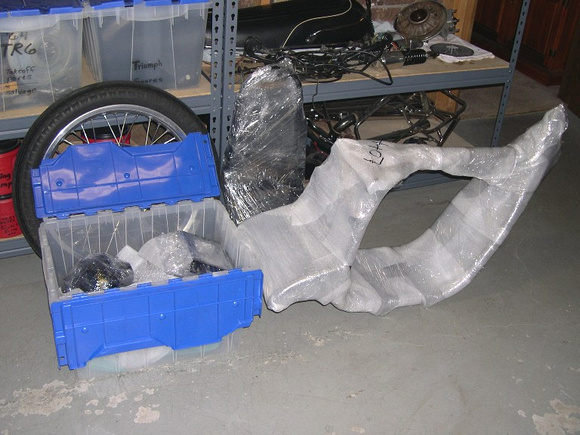 Then I pulled off the Vetter fairing and put it away (more on that later -- it turned out to be rather unique). I also removed the mirrors and crash bars. That made the bike narrow enough to go through a pedestrian door into the basement where it will live till it's ready for sunlight again someday. Get on with it, man!!!! Thanks for the comments. Mark_S, I see you are from NZ. 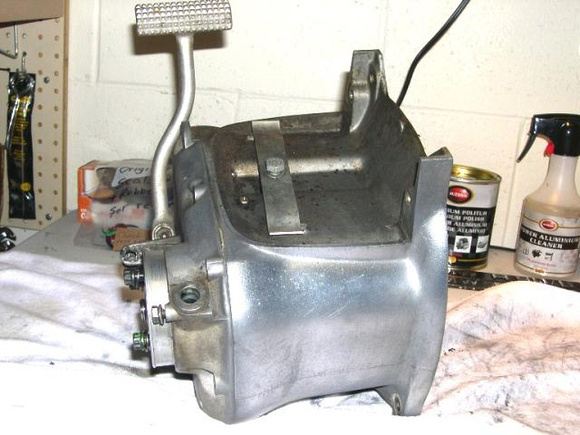 When I was working on my TR6 I got some of my very best help from NZ and Oz. There must be something in the beer you guys drink -- there are so many talented motorcycle people in that part of the world. My buddy who sold me this bike came across with some good stuff that went with the deal, bless him for that. He still had the original front fender, the original rear shocks, the Krauser bags, all the keys (including the round headed key and the folding key) for the bike and for the bags, the original owner's manual (which incidentally is very good -- better written than the BMW Factory Service Manual in many respects), and some other period booklets. One is a 30 year old Catalog & Price List from Capital Cycle -- think they'd honor their 1985 prices? The Vorwort (Forward or Preface for us English speakers) says, "This Service Stations booklet provides a list of all BMW Importers and BMW authorized dealers in Africa, America, Asia, Australia, and Oceania." Very cool! Of course, since 1974, the world has rearranged itself quite a bit. 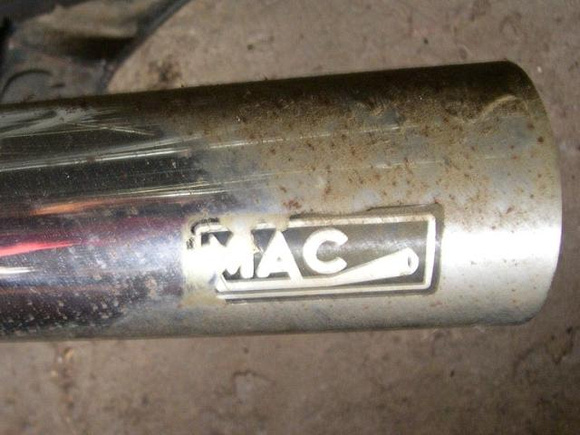 Still, it is an interesting bit of provenance to go with the bike. Once I could unlock the seat and have a peek under it, there was some more stuff. There was the tire pump (seals rotted away) and the complete original tool kit, including the BMW shop towel. 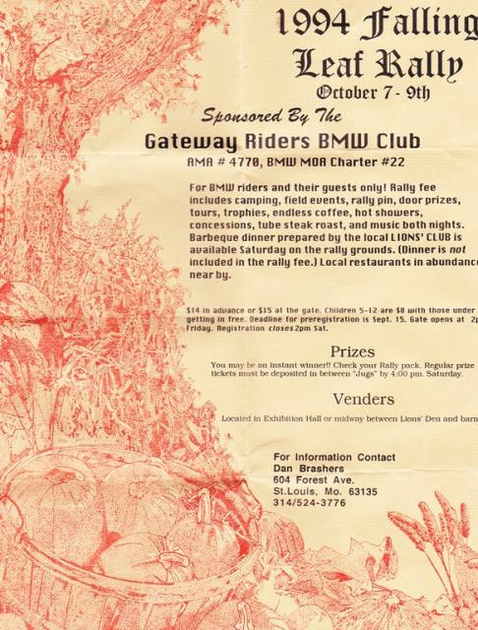 Along with that, there was a flier from the 1994 Falling Leaf Rally in Potosi, Missouri, Maybe some of you were there. This is, of course, an ongoing rally and is home to the black powder anvil blast. When (IF?) I get the old Beemer roadworthy again, this is the first rally I want to attend. I figure the bike should remember how to get there. But, my friend who sold me this bike wasn't the rally attendee. That was the first owner. I'll just call him PO #1. He is also the gentleman who saved the original stuff I listed above and passed it on to PO #2 when he sold him the bike. The first two owners worked together and were good friends. I don't know PO#1 personally, but I have talked to him on the phone a couple times. I told him I have his old motorcycle, and he's been very nice about filling in some history for me of the bike's early days. 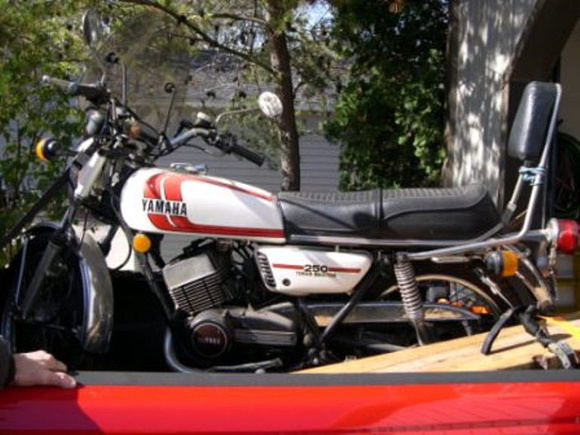 He bought this old airhead brand new in 1974 from a dealer called Cycles Unlimited in Colfax, Illinois -- no longer in business there. He used to have some service work done by another dealer at St. Joseph, Illinois (also long gone). The place in Colfax was about 45 miles from Rantoul Illinois, where Craig Vetter started his company (more about that later). PO#1 is a big guy, not fat, just big. Since he went about 300 pounds in those days, and he rode two-up with his wife, carrying gear for their long rides, he almost immediately set the bike up with a set of air shocks. They were still on the bike forty years later when I bought it. He also added a Vetter Fairing, a Vetter Rainy Day front fender, some auxiliary foot pegs, a backrest, and the set of Krauser bags. With this setup, he took the bike to California and made a couple trips to Mexico. He and his wife enjoyed lots of BMW rallies. These were a lot like what many people used on cars back in the 60's and 70's. They had a plastic air line running between the shocks and a little on-board pressure gage with a schrader valve to adjust the pressure. 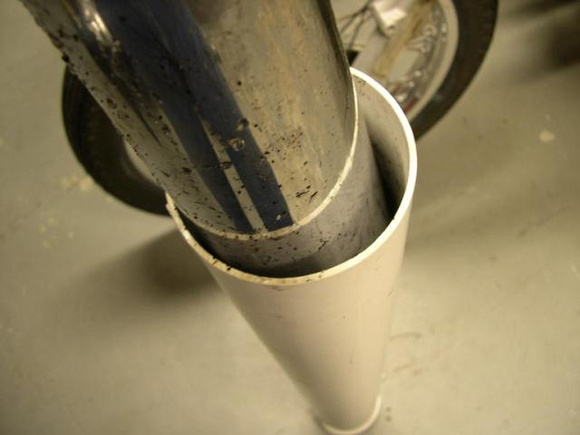 Amazingly, they were still at about 45 psi when I got the bike, and it had not been ridden for sixteen years. 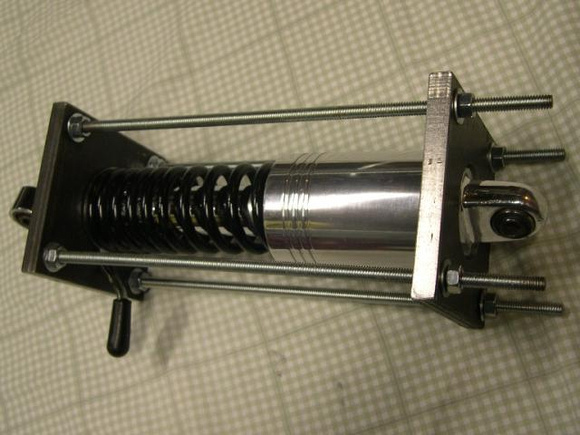 I don't trust rubber tires after about six years, so I sure didn't trust the rubber bladders in these shocks after forty years. I gave them the pitch when I got started with the bike. They did do the job well for PO#1 -- he liked them. 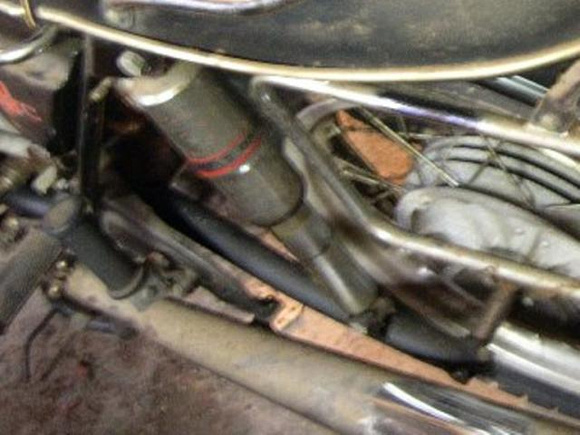 When he put these on his nearly new bike, he saved the original take-off shocks. Those have been passed on to me as well. The shock in the picture has been apart and cleaned up. I stuck it back in the fixture for a picture. The shocks are almost NOS. 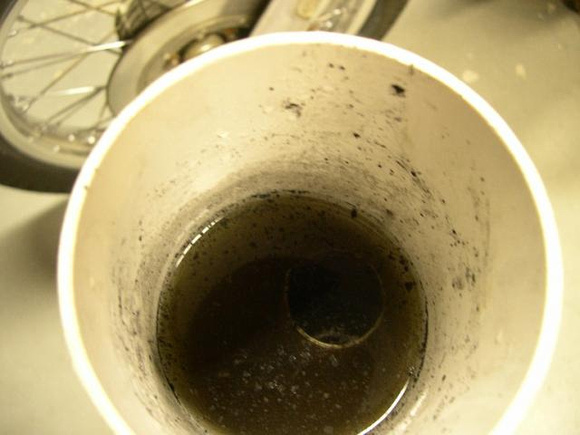 They cleaned up nicely, have no sign of leaking, and they still have damping. I've read that the OEM shocks were nothing to brag about, but I'm going to find out for myself. Foot dragger, Pezz_gs and kenbob like this. The alloy parts were nasty. I first thought I was going to do a quick clean and move on, but I decided it would be tough to do this with the engine in the frame. So, I decided to pull the engine -- yes, just to clean it! Project creep was setting in already. 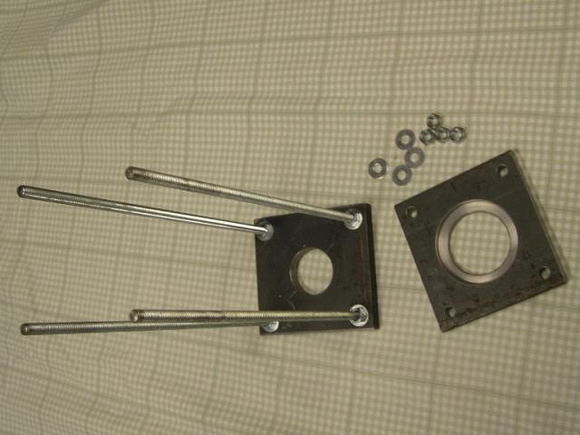 I bought an exhaust nut tool from Jeff Trapp at Northwoods Airheads. From different suppliers' pictures, his looked like the most robust one available. It is, and it fit the finned nuts perfectly. Both exhaust nuts came right off. I was a little worried because they say to take these loose once a year and coat the threads with anti-seize. Mine had been untouched for at least 20 years (maybe longer). 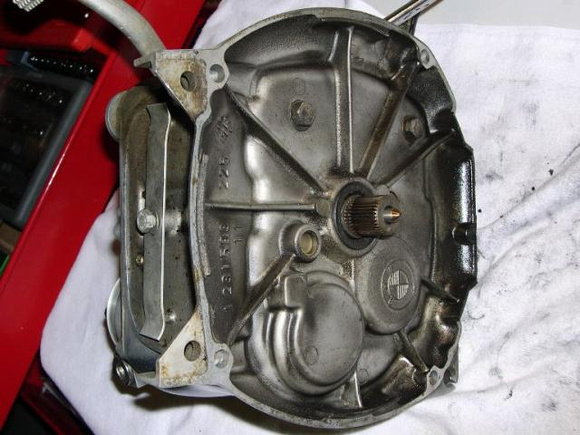 The engine came out as one lump, with the transmission still attached. This worked, but may not have been the easiest or smartest way to go. Clymer said to get help, but I got 'er done by myself. Anyhow, I put a tie-down strap under the jugs, but above the push rod tubes. Then I removed the transmission and started cleaning it. 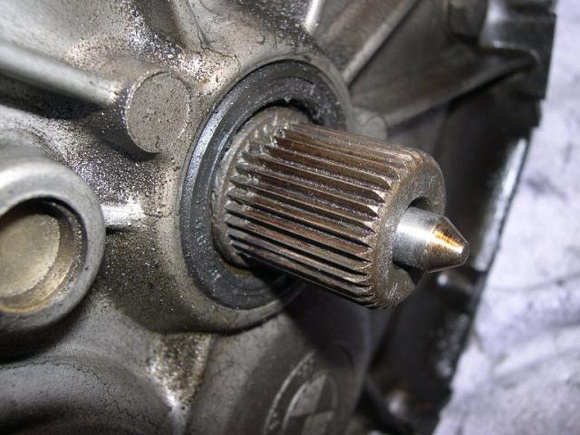 The input shaft splines were in good shape, and there wasn't a lot of oil thrown around where it didn't belong, at least compared to pictures I've seen on-line. I will replace the seals. I've read a lot about the joys of owning the first year of the five speed box. This one still shifts and works by hand through all the gears. PO#1 said it had never given him any problem and it shifted great. He said it has never been apart. 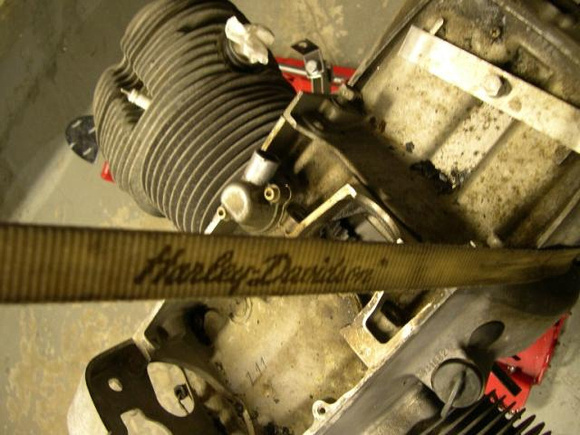 The pawl spring is supposed to break at around 30K miles, and this bike has 40K. I think I'll try it and see what happens. From what I have read, there is no use cracking this thing open because it's full of NLA parts inside. I'll carry the little special tool that will let me shift it into limp-home mode if the spring breaks, and hope for the best. It's described on Snowbum's site. The first owner racked up nearly all the miles on this bike. He said that he never much liked riding around town, instead preferring longer trip rides. He also said that even back in the day he had heard that the kicker was fragile. He told me that he kept a good battery in the bike and always used the electric leg. Maybe that's why this thing didn't go kaput at 30K miles. So . . . I cleaned it up and will worry about it later. Cleaning it was easier said than done. It took me a long time. Here, I had part of the case pretty clean after trying all sorts of methods. I read all I could about BMW alloy cleanup on the internet (I don't think I missed anybody's ideas on this). But I still didn't like it. Rub 'n Buff is kind of a miracle cure for this old alloy. The preferred BMW look seems to be a sort of uniform, dull, matte white aluminum oxide. 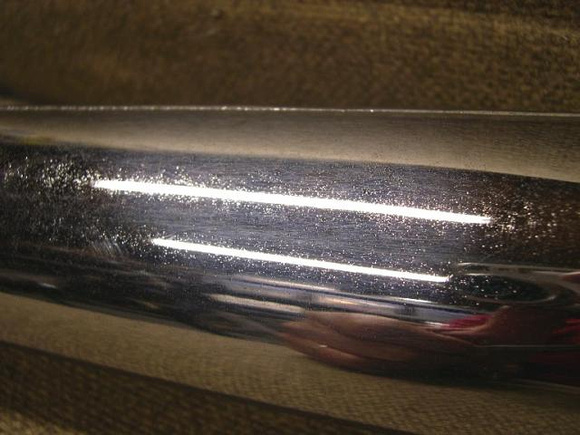 Any metallic shine that leans toward silver or gray seems to be unappreciated. 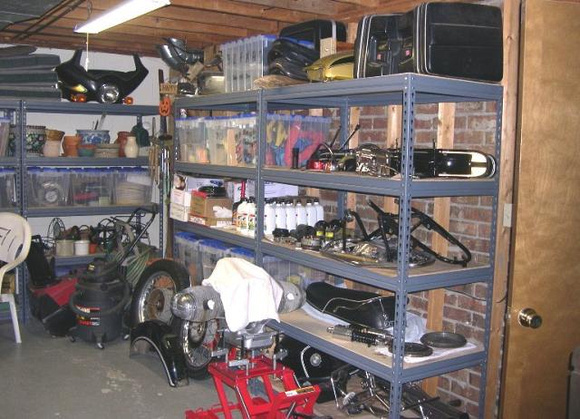 That is tough to achieve if your metal parts have been let go for too long and too far. 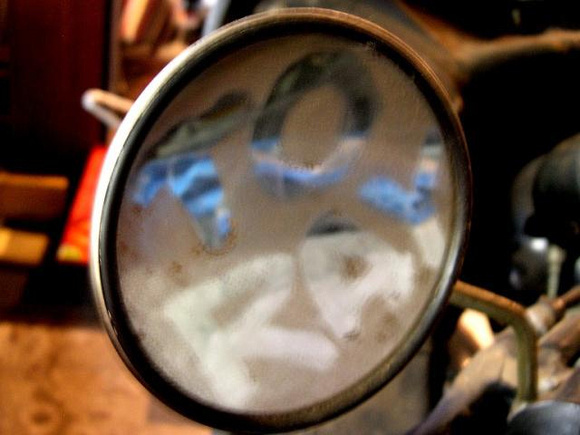 Short of vapor blasting, Rub 'n Buff is the easiest way to go. 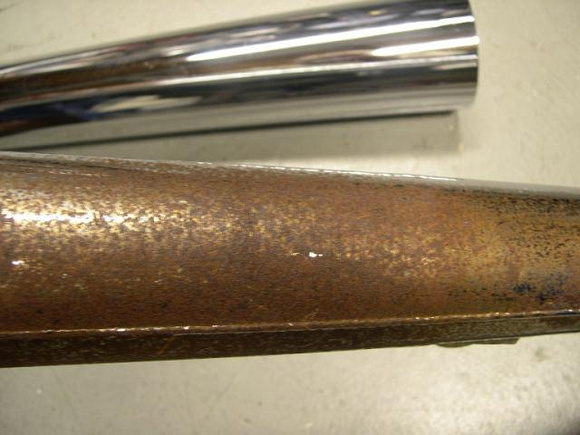 The Rub 'n Buff appearance can be easily changed by how much buffing you do after you apply it. 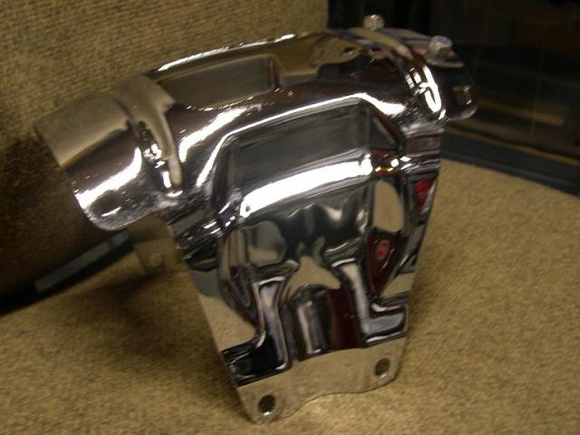 If it is too shiny, you can rub in a bit more and then go easier on the buffing. If you don't like the stuff at all, it comes off pretty easily with mineral spirits. Myself, I like the look, though many don't. As I was doing this grunt work and climbing the learning curve, I tried not to dwell on the fact that this box is most likely a time bomb that will shell itself later on. However, some people say their first year five speed boxes are still working great after lots of miles.